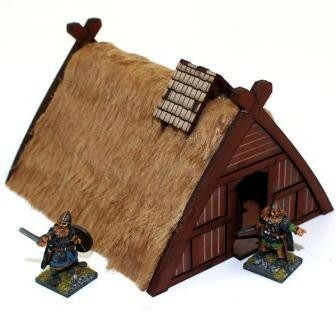 In Norse communities this kind of larger �A� framed building was typical of craft workshops and larger outhouses. In a Norse �Hafn� (harbour/port trading town) this type of building would house the workshops of craftsmen who might themselves live in dwellings close by. Though for a lesser �Bondi� (free born oath giver), this could just as likely be both family home and a place of work. A prosperous �Kaupamadr� (buyer and seller) might need a building of this size as a store room close to his merchant house/shop. The wooden track-way streets of a �Hafn�, especially the lesser side streets, could have buildings like this interspersed with smaller huts along most of their length. A Freed �Fostre Thrall� (hereditary slave) was a �Leysingi� (Freedman), they were still at the beckon call of their former master�s household (it took two generations as �Leysingi� before their oath had value and they could be considered a lesser �Bondi). �Leysingi� families often lived in hovels like this, usually the hovel was still owned by their former master�s family and though their working lives could be hard, usually working for their old master, they were not �Fostre� and their grandchildren would be �Bondi�.